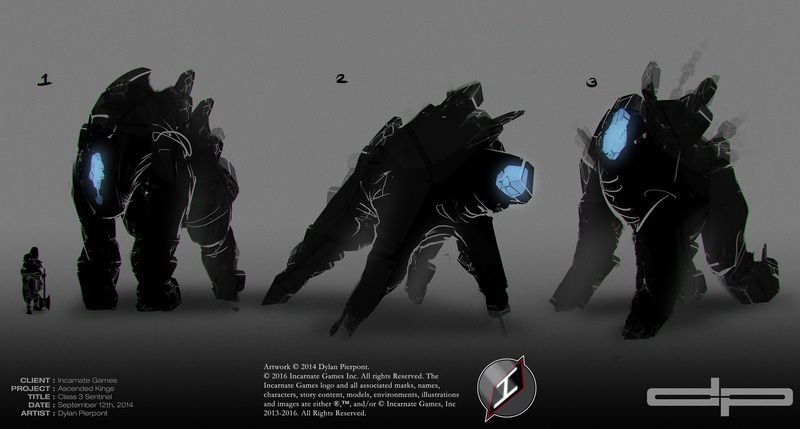 I would really like to see the concept development proceed through on the Sentinels first. This is due to both my sheer curiosity and that splinter in my mind that simply must know what the Sentinels look like. So, lets focus on them first. That said, remember that there are 5 Classes of Sentinels which are essentially an evolution of each other, each more powerful than the last. So with this in mind I will ask you: Which Class do you think would be best to start with? I think it could be approached one of two ways. As you know, the Sentinel that will be depicted on the cards in the game will be a Class 3 Sentinel. We could start with that one to give you a baseline to conceptualize what came before it as well as what it evolves into later, but would this create a problem for convincingly translating a graduation of evolutionary phases? I don’t know, but if that’s true, we could just start with the Class 1 and work our way up. I would love to see that little chibi golem guy that I described in the comments of the Scion thread, but I wonder if we start there that it might end up having an subconscious effect that the Sentinels cannot be taken seriously. Either way, I’d like to hear your thoughts. Starting a dialog on this topic might be the best way to begin. For the C1 Sentinel, I want for the design to express the same level of "cute" that chibi characters do, but only for these baby Sentinels. The idea I have is that although this game is on a serious level, we will have that one cute little golem chibi looking guy that can be used to further appeal to younger audiences. I envision he would make little grunt noises and move really fast and do silly things! I’ll shoot off thumbnails for the Sentinels tomorrow (Friday). Thursday crept up on me and I forgot we agreed on both these and the Kynazarr update today. My mistake. and Class 2 and 4 should be simple because we can just split the difference between the others. No worries. I’m glad you decided to do the Class 3 first, that makes sense like you said as it will serve as a good anchor point to expand in either direction. I look forward to seeing how it turns out! Alrighty! Here’s our first round for the Class 3 Sentinels. The biggest thing I wanted to work with was the overall gesture and composure of these guys. You mentioned in the doc that at level 3 they finally have use of their outer limbs. So I wanted to try and find different ways of emphasizing those features. #1 is a bit proud Pretty much like you’re typical silverback gorilla stance. #2 is a bit more aggressive with it’s forward facing rock features and wide stance. And #3 is sort of a middle ground where it’s very benign somewhat relaxed. I imagine him to be strong and capable, but not overly peacocky if that makes sense. These are cool man. I am good with these, I like the design choice to show the stone plates (and the shapes in them) on the backs of all three. I like the stance of number 1 the best. I like the faces of 2 and 3. I like the way that there is some kind of phasing of stones around the outside of number 3, its like a lens flare of stones, almost like it suggests the source from which it gains further mass? From “somewhere else” the rocks manifest. If I were to suggest anything it would be a combination of 1 and 3. I have put together I sort of silhouette based off of number 1. I think that giving number 1 more of a head would give it the suggestibility of upward growth, yet the shear mass of its back and arms cause it to mostly use its fists on the ground as it walks. Here is the image, remember this is merely a suggestion to convey my thought and doesn’t necessarily need to be adopted, but I think it gets the idea across. Perhaps even just making number 1’s arms even longer would give it a chance to stand just a bit more upright. Either way. Sounds good! I like these suggestions. Would you like me to move forward with a second round of sillos centered around your modification? Also! And this just came to mind after I thought back on the playable demo video you posted. You talked about the sentinels being used and printed on the playing cards. I’m wondering if you had any intentions to use their images elsewhere in the game, or even somewhere in the future? If you ONLY ever intend to use them on the playing cards, because of the small size of the card, going as detailed as we did with Kynazarr would almost be overkill, because you won’t be able to see most of that detail when it gets shrunk down. However, if you’d like the the Sentinel images to be used as additional marketing artwork that can be displayed large alongside Kynazarr, then I would say the process will remain the same as we’ve done in the past. Just wanted to make you aware of that. Let me know what you think! The sentinels play a much larger role than the scions. However in terms of marketing illustrations, if we were to use the Sentinels it would be the Class 5 sentinel walking either through the ocean or across Empyrnea to show what the Empyrneans are up against. We will cross that bridge when we get there. However, yes, I anticipate the Class 3 Sentinel (which is on the card) will only be used on the cards and in the rulebook. So for the final images that will be placed on the cards, do you think we would go with your Concept (2 days) level of art that you have listed in the pricing example? Perfect. The 2 day (16 hour) mark should be just fine. That’s going to reduce in size especially well because detail at that level tightens up when shrunk down. Just to re-iterate, did you want to move forward with a second round of sillos for the class 3’s? Yeah I think we should. Lets make 1 like the comp I did. Lets make another that has longer arms so that he is standing more at a 45 degree angle of with that same style. And then the 3rd how you think best. Stay tuned for EPISODE # 026: Vara Tonals which will be posted soon!